The eye is too large. The cornea (clear window at the front of the eye) is too steep and thus pulls the focus of light in front of the retina. The lens in the front of the eye is too strong and pulls the focus of light in front of the retina. In myopia, vision can be corrected by altering the curve on the front surface of the cornea to make the curve flatter. Light then focuses further back in the eye on the retina. 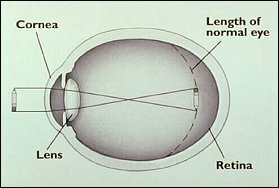 Currently, it is not possible to alter the clear lens of the eye except to remove the center of the lens or remove the lens. This is commonly done for a cloudy lens during cataract surgery. 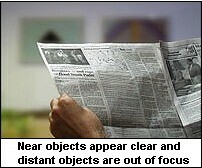 One new technique for eyes with very severe myopia (or even for eyes that are extremely farsighted as described below) is to place an artificial lens inside the eye in front of the normal lens to help with the focusing. Another alternative is to remove the normal lens of the eye and replace it with a lens implant to correct the distance and/or near vision. Both techniques are controversial. We look forward to working with you for a lifetime of good vision! Call our office today at 262-338-0505 to schedule an appointment or, use our online Request an Appointment form.